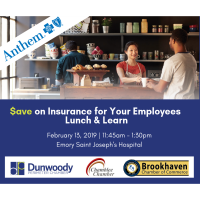 The Dunwoody Perimeter Chamber, in partnership with the Brookhaven Chamber, Chamblee Chamber, and Anthem Blue Cross Blue Shield, will host a lunch & learn workshop on February 13, 2019, at 12 p.m. for small business employers to learn about the Georgia Chamber SMART plan. The workshop will be held at Emory Saint Joseph’s Hospital at 5665 Peachtree Dunwoody Rd., Atlanta, GA 30342. This plan allows smaller employers to join to share in the overall claims risk. By being part of a larger, self-funded pool, employers have financial protection backed by Anthem. During this workshop, attendees will learn how to take advantage of this great program and save. Representatives from Anthem will be on site to provide education and answer questions. Dunwoody Perimeter Chamber Board Member Brent Morris of CBIZ, Inc. will also give an overview of how this program is saving real businesses real money. Attendees will also enjoy lunch. “We are so excited to bring this program to our small businesses. We understand the value and importance of providing affordable healthcare for employees, and that there are barriers that can prevent small businesses from accessing affordable healthcare. We hope that this program will be able to make the process easier,” said Stephanie Freeman, President & CEO of Dunwoody Perimeter Chamber. All brokers, chamber members, and businesses who have 2-50 eligible employees are invited to attend. While the event is free to attend, advanced registration is required for this event. Registration will end on Monday, February 11, 2019, at 1 p.m. This event is currently sponsored by Anthem Blue Cross Blue Shield, Dunwoody Perimeter Chamber of Commerce, Brookhaven Chamber of Commerce, Chamblee Chamber of Commerce, and Emory Saint Joseph’s Hospital. Please visit the event's page on www.perimeterchamber.com for more information. You may register for these opportunities by reaching out to Britney Hardweare at britney@perimeterchamber.com or at 678.244.9702. At Anthem Blue Cross and Blue Shield, we understand our health connects us to each other. What we all do impacts those around us. So Anthem is dedicated to delivering better care to our members, providing greater value to our customers and helping improve the health of our communities. Furthering the healing ministry of the Sisters of Mercy, Emory Saint Joseph's Hospital gives tangible expression to Christ's merciful love by providing compassionate, clinically excellent health care in the spirit of loving service to those in need, with special attention to the poor and vulnerable.